Registration is open for the Nov. 17 Bauer College Alumni Association networking breakfast, featuring City of Houston Mayor Sylvester Turner. The Bauer College Alumni Association hosts monthly networking breakfasts for Bauer alumni to network and hear from Houston’s leading business professionals. The events cost $35 and are held at the Houston City Club. To register for the Nov. 17 BCAA breakfast featuring Turner, click here. For more information on BCAA events, click here. 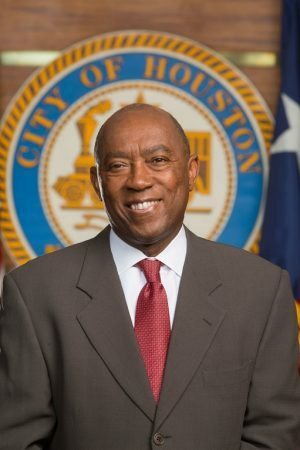 Sylvester Turner was born and raised in the Acres Homes community in northwest Houston. His parents moved to Acres Homes in 1954, the year Turner was born. Turner’s mother worked as a maid in the old Rice Hotel in Houston. His father worked as a painter for Continental Ensco and cut yards with his sons on the weekends to make extra money. The Turners raised nine children in their modest two-bedroom home in Acres Homes. Turner lost his father to cancer when he was 13 years old. Afterward, his mother took over the Turner household. Although she never finished high school or learned to drive, she ensured her children got an education and inspired them to achieve. Turner attended neighborhood public schools until forced integration came to Houston and he was bused to Klein High School. After a predictably rocky start, the student body adapted to its new enrollees – and Turner was later elected president of the student body and graduated as valedictorian. Turner graduated from the University of Houston and Harvard Law School before joining the law firm of Fulbright & Jaworski. He later founded the Houston law firm of Barnes & Turner in 1983.